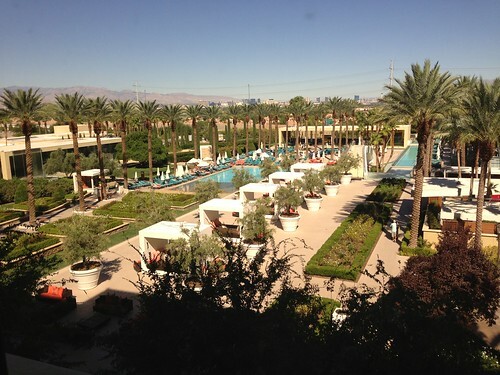 At long last I’m finally blogging about my trip to Las Vegas for Inspiration Unlimited 2012. A warning, this will be long and full of lots of pictures!! I was genuinely concerned at the outset of this trip as my fankle hadn’t recovered overly well before I left. I was still in physio and I still couldn’t walk a heck of a lot. 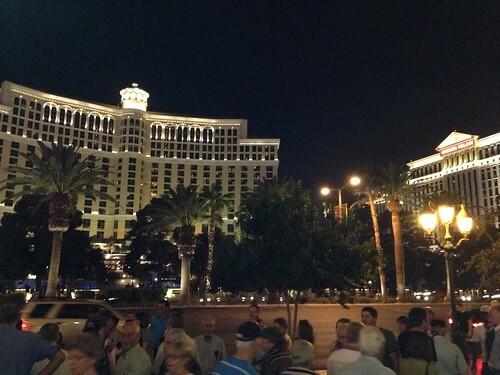 And If you know anything about Vegas, it’s that there is a TON of walking to be done!! 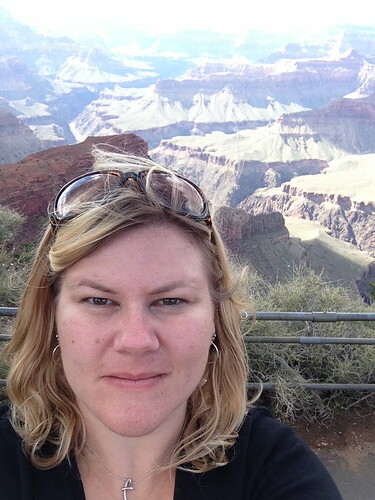 This girl had lots of plans that I’d been making since last year when I realized how much I didn’t get done on my first trip: the Grand Canyon, Fremont Street, the iconic sign at the south end of the strip, watching the Bellagio fountain show, and riding the mechanical bull at PBR Rockbar. I’m happy to say this time I accomplished all, bad fankle and all, except the mechanical bull. I feared getting hurt again/still/worse from getting tossed from the bull and I wasn’t sure how I could explain that to the physio after all the work he’d done on me all summer. I got in on Saturday night, which also happened to be fight night at MGM Grand (that of course was not scheduled when I booked my plane tickets), which means Vegas was a zoo. 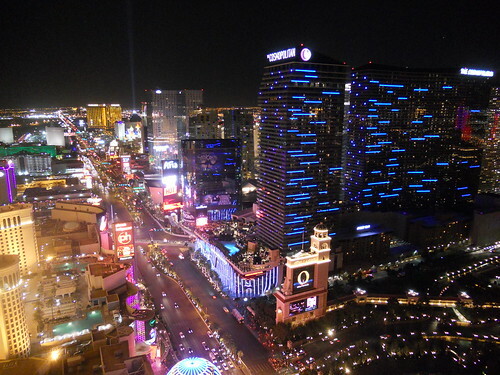 I wanted to stay at Planet Hollywood for the duration of my time on the strip, but for that Saturday night PH was crazy expensive, and they had a mandatory Friday checkin for that night. I opted to stay at the cheap and cheerful Hampton Inn Tropicana for the one night. It was one of the only hotels that still had availability and not jacked rates. Minus the free airport shuttle that was a total disaster (that I waited almost 2 hours for a pickup), and trying to get a taxi to come pickup when it was time to leave, the Hampton was fantastic. The service was good, the location was great, and the room was clean. 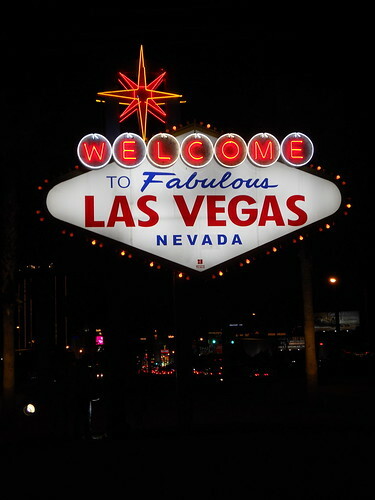 By the time I finally got there, my foot was swollen and sore from the flight, and I was tired so I didn’t venture out to the strip at all. Sunday morning I was up early for Vegas time. I got to enjoy breakfast in bed from the buffet downstairs and watch the tail end of Sunday NFL Countdown, and the start of the first football games. Then it was time to checkout and move on (finally!) to Planet Hollywood. I was so happy to see this sign again! I love staying here. I love the atmosphere. I love the location. I love the amenities. 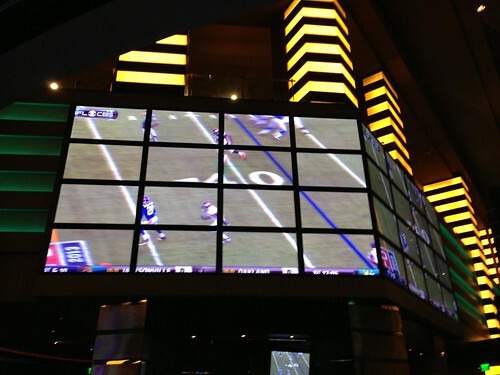 I loved going up to the Heart Bar after finding my room to see how Sunday football really should be watched! Oh, and that room? I splurged a little and got a strip view. 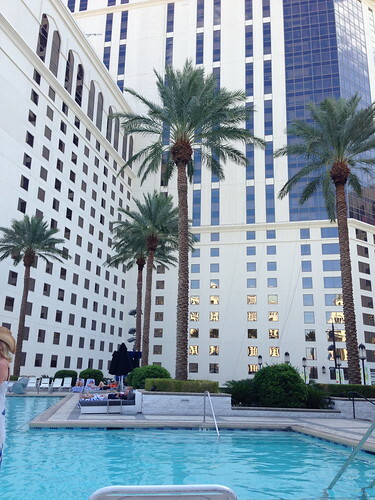 I couldn’t justify going to fountain view, and the advantage of where my room was is I had a great view of the Cosmo pool where Enrique Iglesias was playing that night! Free show! 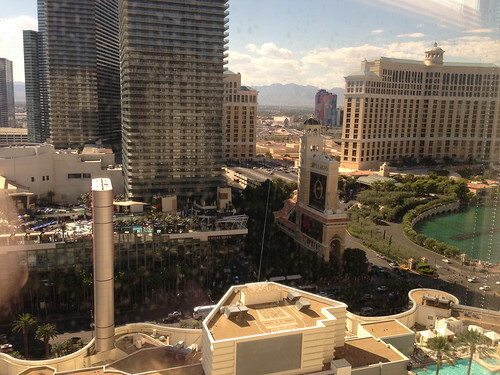 Here were my daytime views – first the Cosmo pool and Bellagio “lake”, and below directly below me to the PH pool, bar and outdoor gambling tables. That evening, still full of energy, after watching some of Enrique (who was fashionably late, natch! 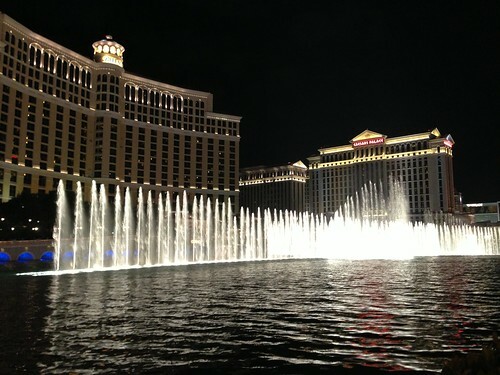 ), I went over to finally watch a Bellagio fountain show. In my super quick stint on the strip last year I didn’t have time to stop and watch the show, this year, I made sure I had time! A beautiful end to a fantastic day. 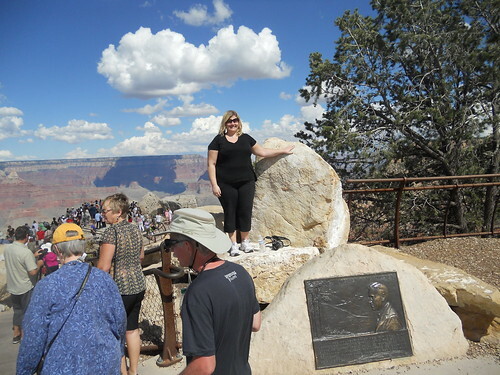 Monday – I picked Monday to be a mostly relaxing and touring the strip day with plans of Grand Canyon for Tuesday, more relaxing and strip on Wednesday, before migrating to Green Valley Ranch and Inspiration Unlimited for Thursday. 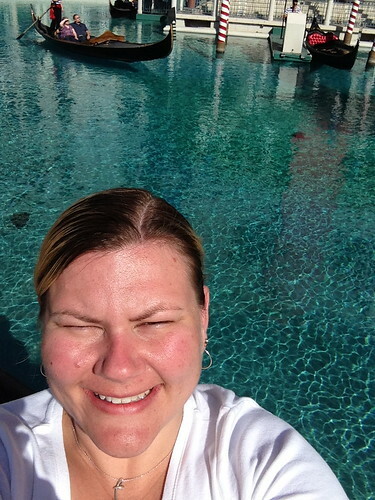 So I started off sunning by the pool with my Starbucks in hand. I tried to use my MyVegas rewards to get a Zarkana ticket but it wasn’t working, so I opted to go over to the box office at Aria and see what I could find. I did check with Tix4Tonight first, and while they said they could get me a great price, they had no idea where the seat was until I got to the box office at Aria, so it only made sense for me to do my own legwork. 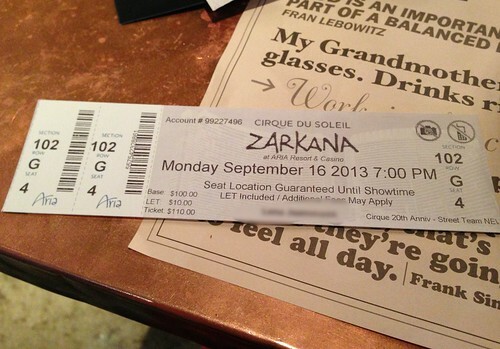 On the way into Crystals, someone in character was handing out discount coupons for Zarkana. I managed to snag an AMAZING seat at a FANTASTIC price. I celebrated my find with delicious pints and oysters at Todd English P.U.B. 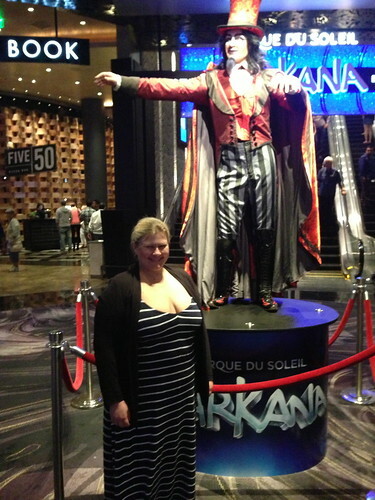 Zarkana was excellent and I thoroughly enjoyed it. I saw O last year and it was definitely the better of the 2, but I wanted to see something new. Next up it was time to go across the street to the Cosmopolitan to the second feature at their “Dive-In Movies” shown on the huge screen by the pool. It was Breakfast at Tiffany’s. Another movie I’d been dying to watch but had never seen in it’s entirety. Well, my busy day and excitement caught the better of me. I got onto my comfy poolside lounge bed, got a great view, saw the first few minutes and the next thing I know I’m hearing Moon River and watching the credits scroll by. Yes, I slept through the whole thing. 😦 Sad girl. 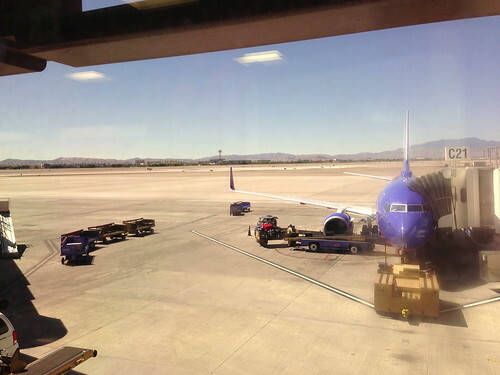 Tuesday – I was up bright and early, renting a car and I was on my way to the Grand Canyon, with detours to the Hoover Dam and old Route 66 with stops in Kingman and Seligman AZ. In the Pixar movie Cars, the town of Radiator Springs was loosely based on the town of Seligman. I have a ton of pictures from this road trip but there are some significant ones missing. Normally, when I travel I use at least 3 cameras to take pictures – my SLR, my point and shoot, and my phone, and sometimes even my Instax mini. When I got to the Hoover Dam I got camera cocky and only used my SLR. When I stopped in Kingman to review my pictures I discovered I had none! It seems I brilliantly left my CF card out while shooting. I’m just thankful I noticed it early on in Kingman, and quickly shed my cockyness and went back to snapping with 4 cameras.. 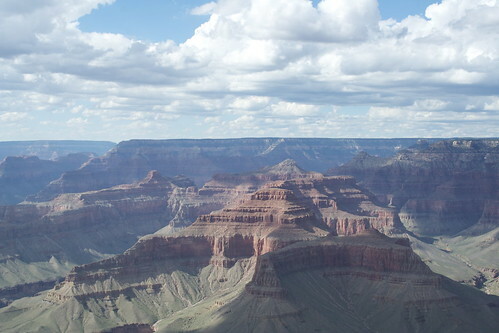 FINALLY, after several trips to Phoenix and now my second trip to Las Vegas, finally I made it to the Grand Canyon, and it was every bit as spectacular as I’d hoped. I can’t get over how big it is. I know that sounds silly when it has the name “Grand” but seriously, so wide and so deep and so long. I took their shuttle bus system all over the park and found the views no matter where to be quite similar, and yet I couldn’t see a lot of the places I’d already been from one lookout point to the next. It’s definitely an excursion that should be on everyone’s bucket list to do at least once. 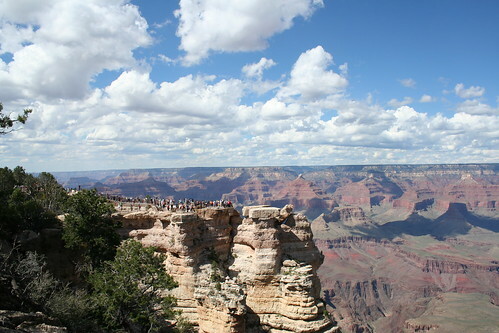 And don’t waste your time with the tourist trap fabricated West Rim, go all the way to the South Rim. On the way back I made sure to stop at the iconic sign. With rental car I went up to my last stop, Fremont Street. 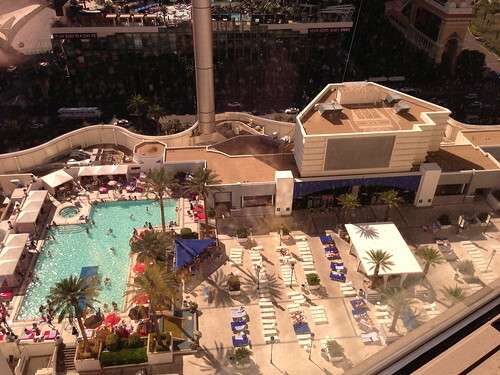 In being fully honest, I really didn’t like it and it was the most unsafe I’ve felt on any Vegas trip. The canopy kept the smoke in, so that wasn’t overly pleasant at all. The laser show was a bit neat. 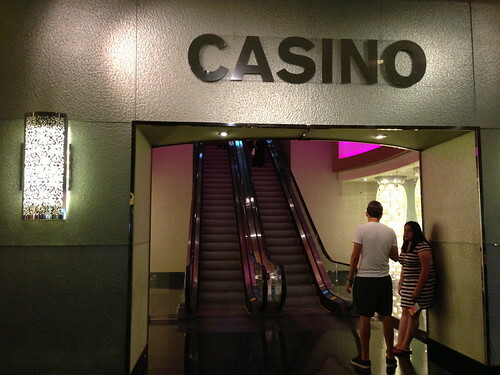 The casinos were dingy and sketchy. The crowds were different than those on the strip. Most of them were quite fall down drunk and had ZERO respect for personal space. 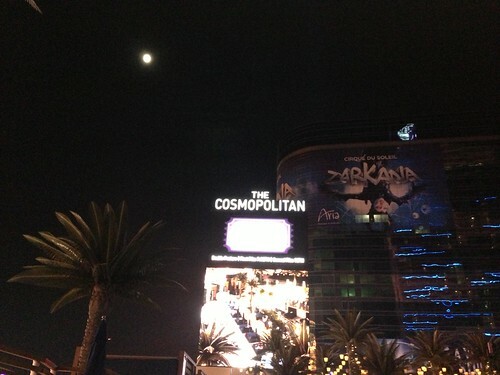 I downed a very overpriced drink and made my way back to Planet Hollywood where I settled in for a well earned sleep. Wednesday was a relatively low-key day. I started off poolside with my Starbucks again, and Skyped home so he could see what he was missing (me, sun, palm trees). 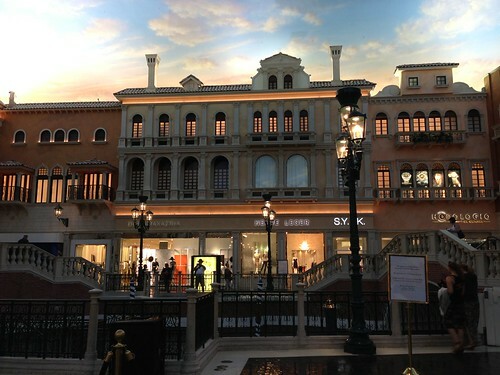 I went up to the Venetian because on my last trip I stopped at the Forum Shops at Caesars and didn’t make it any further north. 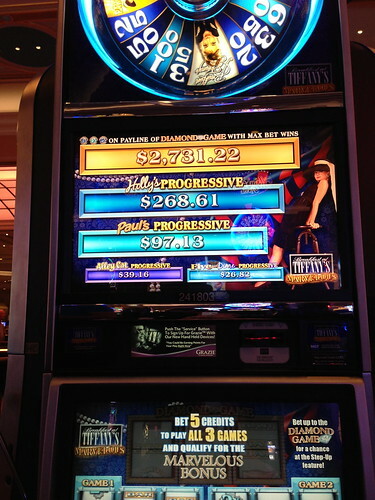 I found my favourite slot machine in their casino and stopped when I was up $5. 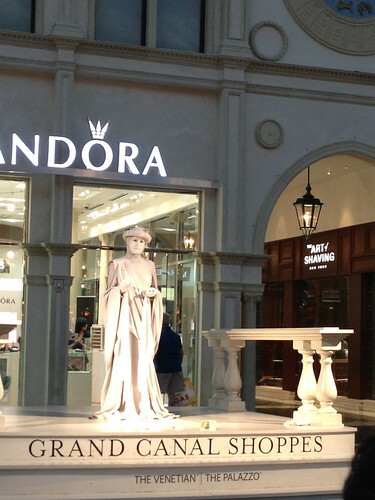 I fell in love with the Canal Shoppes. Some of the gelatos there looked positively heavenly. I’m not sure how I managed to resist but I did. That being said, I had a spectacular lunch there at Morels. I paid for the cheese fondue for 2 with a caesar salad and 2 for 1 vodka tonics on the patio that overlooked the strip and the outdoor canals. 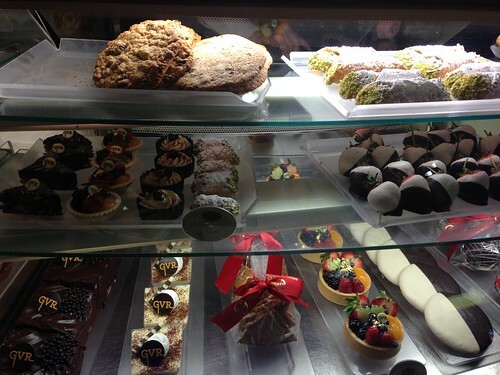 It was incredible and I was truly living the dolce vita that afternoon. 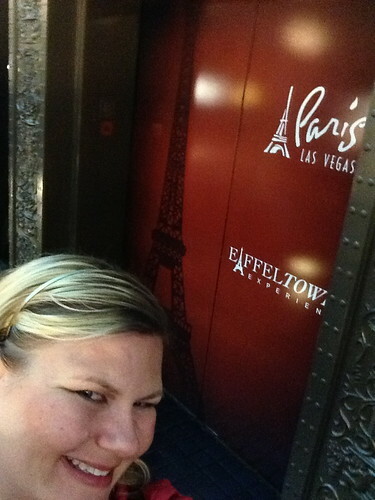 I went back to Planet Hollywood to get cleaned up for dinner as I had plans to go to Paris to try Mon Ami Gabi and go up the Eiffel Tower, yes another thing I hadn’t done yet. 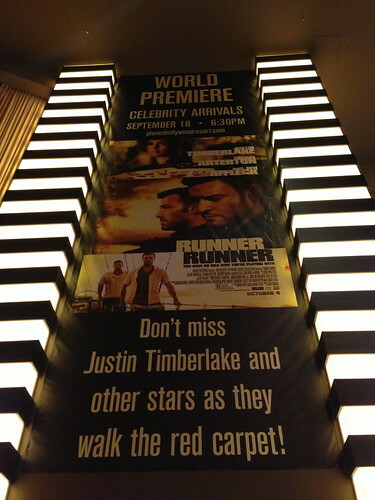 There was a red carpet event going on at Planet Hollywood I thought I may try to take in before dinner, but by the time I got back there, the area surrounding the carpet was already packed, and I’m short, and the celebs were late (natch!). Yes, I opted to give up on trying to fight for a glimpse of JT and Ben Affleck, and as I later found out Holly Madison too. Bummer! 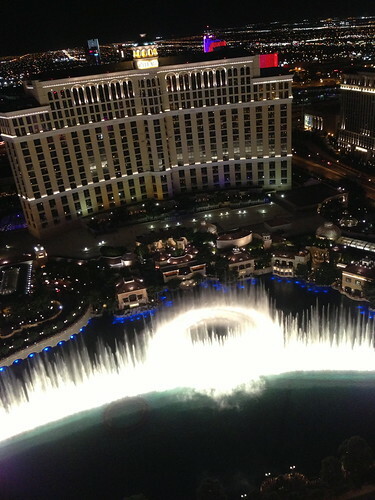 I did make it up the tower for some spectacular views of the Vegas strip and the Bellagio fountains. I then went down and my patio strip side table was ready at Gabi. I had a great spot to people watch, watch the fountain show over and through the palms, and my dinner was so incredible. After dinner I went back to the Heart Bar at Planet Hollywood for a nightcap or two of my new favourite cocktails, cherry bombs! So so so delicious! 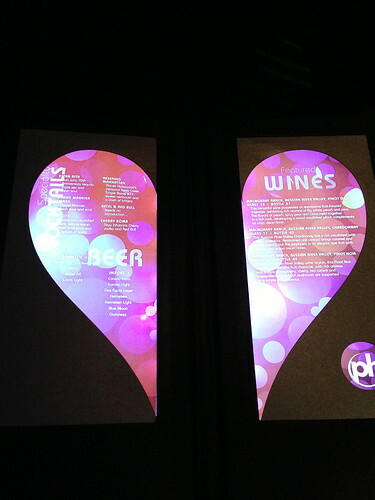 And I couldn’t help but take a picture of the super neat light up cocktail menu at the Heart Bar. 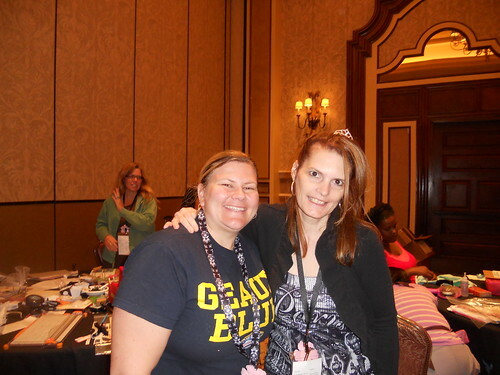 And with that my time on the strip was over and it was time to relax and scrapbook to my heart’s content at Inspiration Unlimited at Green Valley Ranch. 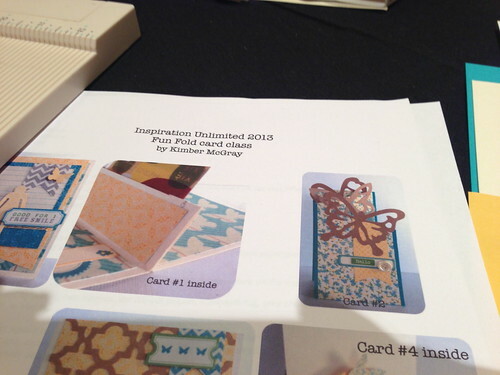 Inspiration Unlimited is bar none the BEST scrapbooking event I’ve been to. Teresa Collins is just incredible and I feel so lucky to get to take 2 amazing workshops with her. Ginger runs a super tight ship like a well oiled machine. The roster of instructors is always top notch. I fully plan on going to every one as long as they continue to exist. I’ve already paid my deposit to return next year. 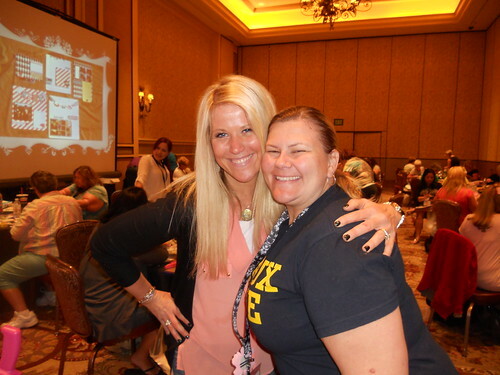 And one of the things I love about Inspiration Unlimited is the friends I see there year after year. I love our yearly reunions! In my defence, it was day 2 and I was tired from my week of adventures and full day of crafting the day before. Missing Patty who was being our awesome camerawoman.. I totally need to get more pictures with friends next year because I’m missing so many..
On Saturday night one of my girlfriends and I got violently ill from the buffet at GVR. I was so sick and it put an incredible damper on my final days there that I had hoped to spend with friends, and by the pool, and relaxing.. essentially anything but spending it in bed and getting very acquainted with the beautiful bathroom. I’m beyond disappointed to say that when I brought it up to the front desk when I was feeling well enough to emerge from my room in the hunt for some Gatorade, they showed no concern whatsoever, and suggested I should call the buffet manager in the morning. I had far too much to do on Monday morning that I couldn’t call the manager and it was time to go. I will return to GVR because that’s where Inspiration Unlimited is, but I will definitely consider alternate dining options while there. 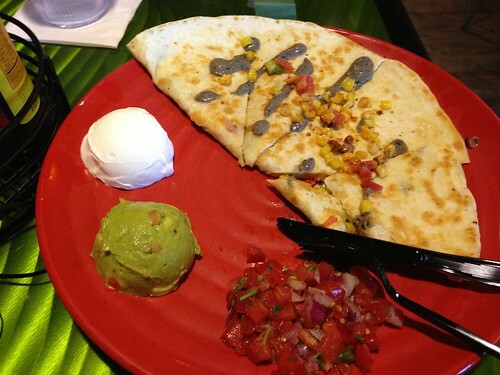 Monday I had my traditional lunch leaving McCarran, cheese quesadillas at Sammy Hagar’s. I opted to skip out on the Can’t Drive 55 drink because my tummy was still queasy and recovering from the food poisoning. 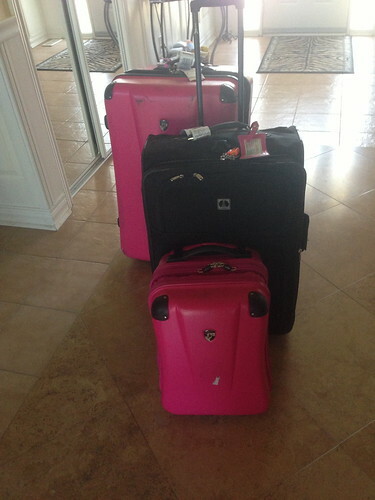 Southwest got me, and all my luggage home safe and sound. What an incredible trip. 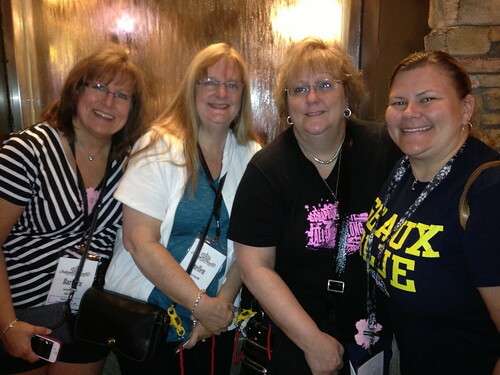 I had so much fun and I can’t wait until next September! In 100% full disclosure I have not been compensated for my reviews in any way shape or form.